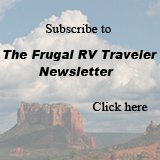 To subscribe to The Frugal RV Traveler Newsletter, the only free e-zine dedicated to affordable adventures, boondocking, and saving money on your RV travels, simply fill in the form below. You will be able to opt out at any time. I promise to use it only to send you The Frugal RV Traveler Newsletter. After so many requests, I've decided to write and publish a regular e-zine/newsletter. "Ahhh...regular?" I can hear you musing. How will this shunpiker who prefers to travel in the direction the wind is blowing her ever "get it together" to publish on a regular basis? Admitedly, that is what has stopped me from this venture until now. But, being a subscriber to other e-zines for some time now, I've come to realize that many who publish monthly at first, eventually end up writing on a much more random basis. I promise one thing only....to write as often as I have something of interest to report - no sooner, no later. I believe that you don't want to hear from me just because it's the first of the month. You want to know that when you open my mail, there will be NEWS in it that is of interest to you. Who can predict how regularly that will be? Not this shunpiker! 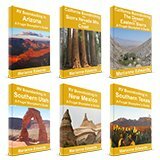 I can promise to put together an easy-to-read format that sends you the links and information you want on traveling frugaly, camping, boondocking, and outdoor adventure travel. Click here to read the back issues! Return from newsletter to frugal-rv-travel home page.